There seem to have been lavatories in the neolithic stone huts of Scara Brae in the Orkney Islands, Scotland, used perhaps 6,000 years ago. At Mohendro Daro in India, about 2750BC, there were privies with seats connected to a drain. About 4,000 years ago in the Indus Valley, now Pakistan, many houses had flushing lavatories, and at about the same time King Minos's magnificent palace at Knossos in Crete had loos with wooden seats, earthenware wash-out pans, and reservoirs for flushing water. Many abbeys in Britain had piped water before 1200AD. Monks were well aware of the dangers of disease, and built efficient latrines---usually in a wing next to the dormitory---with many seats, because their strict timetable meant the monks all had to relieve themselves at the same time. Sometimes, as at Furness, the seats were back to back. At Fountains Abbey in Yorkshire, there was a latrine block for the choir monks on the east side of the River Skell, and one in the middle of the river, with lavatories on two floors, for the lay brothers. When the abbey was rebuilt in the twelfth century, the engineers changed the course of the river by 26 metres, and constructed a stone-lined drain along its course with a continuous flow from the river to flush both sets of lavatories. Many so-called 'secret passages' in abbeys were in reality drains leading to the main sewer. See also Abbot of St Albans. Royal residences provide some information about lavatories, but alas succeeding generations tend to replace them when better ones are available. At Hampton Court, Henry VIII's courtiers used a large communal lavatory designed on the garderobe principle, called the Great House of Easement (see illustration, p76 of the book). There were two rows set back to back on each of two floors, with views over the east and west fronts of the palace. Each seat was a single plank of oak with holes at regular two-foot intervals; so at breaks in court proceedings the loos must have been quite cosy. The effluent went down angled chutes into a communal brick drain, which ran under the moat and into the River Thames. However, there was no flushing system; so after the court had been in residence for a month, the smell from below must have been ripe, and the King's gong-scourers would be faced with head-high chambers full of waste to clear out. Henry VIII himself preferred to use a close stool; see royalty. For an Elizabethan interlude, see Harington. In the 1660s, Samuel Pepys recorded in his diary that he had 'a very fine close stool' in his drawing room, and a cesspit in his cellar. He also writes of taking a lady to the theatre in 1663. She wanted to go to the loo, but there was none in the theatre 'so I was forced to go out of the house with her to Lincoln's Inn walks, and there in a corner she did her business, and was by and by well, and so into the house again...'. During the early 1690s, at least 10 water-closets were built at the great mansion of Chatsworth, with cedarwood, brass fittings, and bowls of alabaster---or marble for the duke and duchess. The water came from the hills above the house. Ordinary people living in the country generally had a privy, which was just a hole in the ground with seats above. In the growing cities, people used privies where they had the room, even if it meant digging pits in their own cellars. But many people simply used chamber-pots, and emptied the contents into the street outside. When they tipped from an upstairs window they traditionally called a warning of 'Gardy loo!' which was probably a corruption of the French regardez l'eau, meaning 'watch out for the water!' (see illustration, p78 of the book). Far overhead the windows opened, five, six or ten stories in the air, and the close stools of Edinburgh discharged the collected filth of the last 24 hours into the street. It was good manners for those above to cry 'Gardy-loo!' before throwing ... early in the morning it was perfunctorily cleared away by the City Guard. Only on the Sabbath morn it might not be touched, but lay there all day long, filling Scotland's capital with the savour of a mistaken piety. Furthermore, in the absence of public lavatories, men walked the streets carrying buckets and huge cloaks, offering for a 'bawbee' (half a penny) the services of the cloak and bucket to anyone desperate to relieve themselves. By about 1830 the population of London had risen to two million. The raw sewage seeped through inadequate drains into the River Thames, which was made even fouler by waste from slaughterhouses and tanneries. As a result of this tide of filth, the middle of the nineteenth century saw a dreadful outbreak of cholera in Britain; in 1849, more than 55,000 people died of it. Such campaigners as John Snow and Florence Nightingale pointed out the link between disease and lack of hygiene. Gradually demand grew for a continuous supply of clean piped water, and for proper sewers. In the dry summer of 1858 the smell of drifting excrement on the banks of the Thames became so intolerable that the Great Stink was debated in parliament, where the curtains were soaked in chloride of lime to enable the members to breathe. 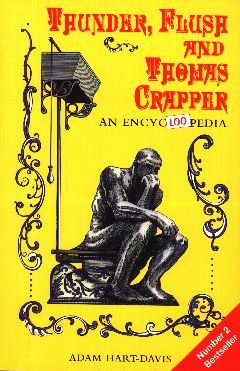 So Victorian engineers began to build proper sewers, and as piped water became available, demand grew for hygienic loos. Between 1860 and 1880 there was a flood of new water-closets.